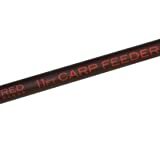 This excel­lent 11ft (3.3m) Method Feeder rod is equipped with 3oz and 4oz glass quiver­tips. 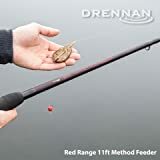 These tips have ideal test curves, being stiff enough to register bites per­fectly when fishing the Method feeder. The light­weight carbon blank is beau­ti­fully bal­anced and has a pro­gressive through action for playing and landing big fish and helping to avoid hook pulls.